Though joking, you suspect he could well be serious. These New Puritans have been many things, but nobody could accuse them of lacking any seriousness about their work. The Barnett institute – that is, the twin brothers Jack and George Barnett – are sat side by side in a converted warehouse space in Tottenham, north London’s formerly industrial topography spilling behind them into the aubergine night skyline. George, the elder twin by one minute and the more straightforwardly confidant of the brothers, apologises for their being a little tired. 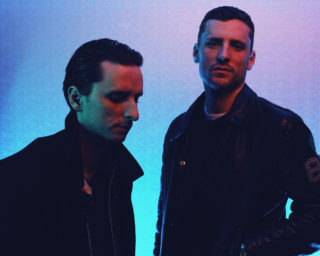 ‘Inside the Rose’, the fourth album from These New Puritans, is their first studio release in six years, and though they’re enthused to be back on the rehearsal and promotion treadmill, they’re also faintly exhausted. Jack, the group’s visionary in chief, though softly spoken radiates a quiet but total intensity. His sense of humour, when it asserts itself, is Ryvita dry – indeed, George spends most of the interview sat at an angle facing his brother, his face oscillating between wry bafflement and genuine curiosity at Jack’s utterances. They edit each other’s sentences, bicker slightly and share gargantuan silences in the way that only siblings do. I put to the brothers that ‘Inside the Rose’ marks something of a consolidation of the band’s previous experiments; making more concise – more pop, even – many of the ideas on their previous three records. George nods, explaining that he found the album to be “a culmination of a lot of the things we’ve learnt”. By the time that touring for their last record – 2013’s ‘Field of Reeds’ – had wound down, the brothers were itching to perform another of their creative volte faces. “We’re never consciously turning in a different direction,” says George, “but by the end of an album we just kind of massively want to turn in a different direction. It’s an impulse that we both have.” Some shows were scheduled in 2015, then mysteriously pulled. “We just thought, let’s go away and make a record,” says Jack by way of explanation. Utilising the same process as on 2010’s ‘Hidden’, the pair first recorded the drums for the album in a studio in West London, with long-time collaborator Graham Sutton. Once the drums were deemed satisfactory, they jumped in a van and headed to the studio space that would define ‘Inside the Rose’ – a former Soviet broadcasting studio in a dilapidated industrial wasteland outside Berlin. The pair are keen to stress that this is, however, not their ‘Berlin record’. Having immediately said that, George concedes to no one in particular that ‘Beyond Black Suns’ “is quite Berlin”. But what marks ‘Inside the Rose’ so notably from the pair’s previous work is its astonishing clarity. Where on ‘Field of Reed’, Jack’s vocal was often little more than a murmur (to quite brilliant effect), here his voice is assertive and to the fore. “I wanted his vocals higher, because I think his voice is just better these days,” says George when I ask if they intended to make such a direct record. So why did you do it so much on ‘Field of Reeds’? I ask. This is an understatement. Upon being invited to listen for the first time to ‘Inside the Rose’ I experienced that rarest of things – genuinely having no idea quite what the album I was about to hear might sound like at all. The possibilities were wide open. Which These New Puritans have we got this time? 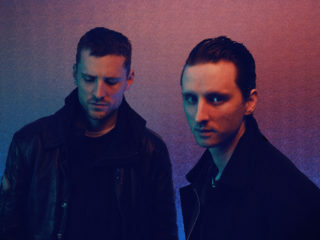 When they were signed in that last goldrush in the middle of the last decade, These New Puritans were associated with the Southend scene surrounded by the Horrors. They were not signed in the hope that they would become genre-busting disruptors; more likely in the explicit hope that they would not. Consider the class of 2008, flogging their tenth anniversary classic album tours – who else has continued to make such vital and varied output? “We arrived in a very conservative, very guitar based time…” says George. 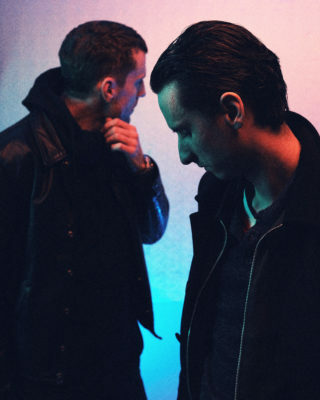 Pulling off such a creative transformation once is good, but These New Puritans did it twice. Immediately after ‘Hidden’ the brothers knuckled down and learnt musical notation, transforming the band into something of a neoclassical ensemble for the wildly ambitious, utterly gorgeous ‘Field of Reeds’. George rolls his eyes at the bemused reaction of their peers and the music press to their learning classical notation – but what others viewed as pretension, George viewed sensibly as “the only way to communicate with a large group of musicians”. “George has got a bit of a vendetta against ‘Field of Reeds’,” Jack smiles. “If you talk to him for five minutes he’ll say something about that record.” George shakes his head, smirking. “I love ‘Field of Reeds’,” he says with a fixed glare. Live shows for that record – documented on the Barbican recording ‘Expanded’ – involved a thirty-eight piece orchestra, so the pair are naturally relishing their new touring line-up as a four piece. “It’s still high concept,” Jack assures me, “but I like the focus on making the music more agile. You can communicate really easy and make changes.” The day of our interview, they’d been rehearsing for the first time the album opener ‘Infinity Vibraphones’. I ask about that track’s lyric about ‘an addiction to the impossible’, which seems to me self-referential. “It’s quite a personal thing,” Jack says. “It’s sort of a personality flaw of mine.” A pause. George arches his head once again towards his brother. “I didn’t know that.” More silence. A smile.